There are dolls, and then there are dolls. 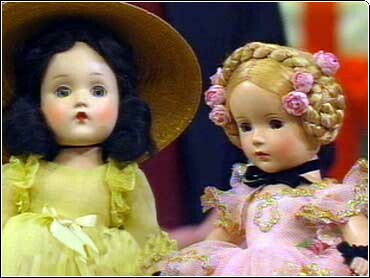 Author of Trash or Treasure: Guide to Buyers and The Saturday Early Show's Collectibles Expert Tony Hyman describes some of classiest dolls around. Beatrice Alexander was born in Brooklyn in 1895 of immigrant parents. An artistic child, at 16 she won a scholarship to study sculpture in Paris, but couldn't afford to go. The world was full of rich and poor, she observed, and she decided she wanted to be rich. At age 20, this determined young woman led her three sisters into making - on her kitchen table - cloth dolls depicting World War I Red Cross nurses. Then she personally sold them for a couple of bucks to department stores in New York and Philadelphia. Today they're very rare, bringing more than $1,000 each. By age 28, Alexander was running her own doll factory. A talented designer who used only the finest materials, she began calling herself Madame Alexander and hanging out with the art elite of New York. Her fortune came when she was licensed to make the immensely popular Dione quintuplet dolls, followed by a similar contract to produce Scarlett O'Hara ones. In the prosperous days of the 1940s and 1950s, she employed in her Harlem factory 600 people to hand paint and dress the country's first hard plastic dolls. They cost $75 to $100 - more than a week's salary - at a time when the typical baby doll cost about $5. Today Madame Alexander dolls are highly sought after and bringing anywhere from hundreds of dollars to more than $10,000 each. For more information on collectible Alexander Dolls, contact Lia Sargent, author of Madame Alexander Dolls: An American Legend, through her Web site at www.liasargent.com. Find out about other collectibles described by The Saturday Early Show's Tony Hyman in the Collectibles Archive. Or visit Tony Hyman's Web site. If you think you have a collectible worth a lot of cash, send an email to sat@cbsnews.com. Put "What's It Worth?" in the subject line, or write to "What's It Worth?" The Saturday Early Show, 514 West 57th St., 6th floor, New York, N.Y. 10019. Because of the volume of mail received, The Saturday Early Show can't respond to all requests, but some will be selected and featured on the program in the near future.